I added washi tape down the side of the card matching up the pattern to create stripes and embossed a section of the card with my dotty embossing folder. I used Old Olive, Coastal Cabana, Smoky Slate and Basic Gray. My stamp set of choice was Wetlands - perfect for males cards and perfect for the recipient who lives by the river where there are literally hundreds of geese! Very pretty Jacqueline. The water colored background looks wonderful with the image. I also really like the striped border. Thank you for playing along with us at The Color Throwdown. Great design... 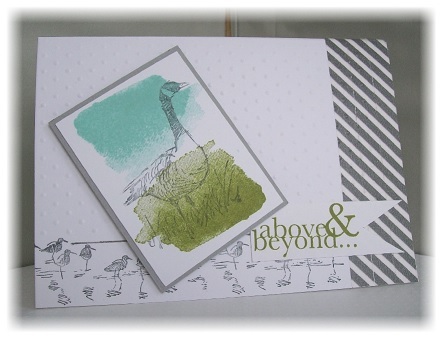 I like the "above & beyond" sentiment for a thank you note, and it goes so well with the birds, too! Thanks for joining us for the Color Throwdown! Very pretty! I love how you've added the stamped birds along the bottom of the card. 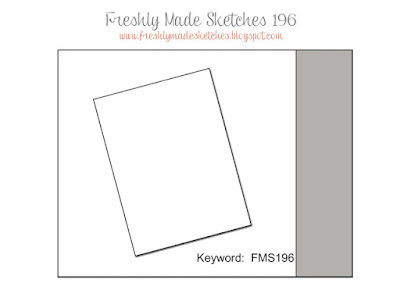 Thank you for joining us at Freshly Made Sketches this week! How lovely! Your stamped image on the bottom and your pretty colors make for a wonderful card. Glad you joined us this week at FMS! Great masculine design! Love the sentiment you used. Thanks for joining us at The Color Throwdown!